What is a triathlon swimskin or speedsuit? And could you benefit from wearing one? These might be the first two questions that pop into your head when you hear someone say, “swimskin”. And what is the difference between a swimskin, trisuit, and wetsuit? To start I’ll recommend a few swimskins you might like to try on. Skip to the end of the article, to read my buyer’s guide. You’ll find the answers to different FAQs you might have about swimskins. My hope is that you’ll be able to decide for yourself if you want a swimskin by the end of this article. How Does a Swimskin Help? What is the Difference Between a Trisuit, Wetsuit, and Swimskin? When Should I Wear a Swimskin or a Wetsuit? Do I need a Swimskin? 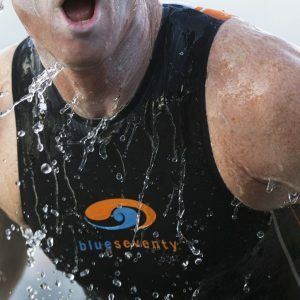 The Blueseventy PZ4TX swimskin is the newest in its model and has a few upgrades from its predecessor, Blueseventy PZ3TX. Through countless tests, the new PZ4TX has a new blend of fabrics that perfectly combines compression and performance. This swimskin is designed with four difference fabrics to give you the best swim possible. The front and back of the swimskin are made of hydrophobic fabric, which gives the piece its compressive and lightweight feeling. The side panels are designed with stretchy material which gives your movements more flexibility. The stretchy material actually works with the hydrophobic material, which makes it easier to swim in. On the inside of the thighs, you’ll find thicker material to make the swimskin more durable. The back features a reflective, thin material that will help regulate your temperature during a warm water swim. Lastly, the swimskin has a locking zipper, which gets rid of the need for a lanyard. Instead, the zipper locks in the downward position and easily unlocks in the upward position. Enough about the technicalities of the swimskin. Most triathletes say that the fit is not too tight but it still has a strong compressive feel. While other suits may be hard to slip on and off, many people rave that this suit is one of the easiest to transition out of when they exit the water. Many triathletes who use this swimskin, say it’s a great alternative if you’re competing in Hawaii. In the water, triathletes say it’s like you’re not wearing the swimskin. It stays very close to the body without restricting their natural stroke movement. The benefits of the compression can be seen in the swim times. Seasoned and even beginner triathletes say they have easily cut a few seconds for their swim portion. Yes, I would recommend this product to you whether you’re a veteran or beginner triathlete. If you’re looking for an alternative to a wetsuit this might be your first choice. You can depend on this swimskin and take it to all your races in warmer water. While the price is can look steep, think about where the extra money is towards. It’s for the different materials used, which help make it durable. The locking zipper, the newest feature, can be your best friend for easy transitions. Think about it, read about the other swimskins in this article, and do your research before ordering your first swimskin. 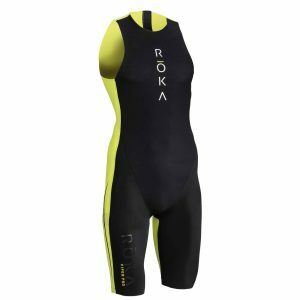 The Roka Viper Pro swimskin is making waves in the triathlon apparel market. And it well-deserves its praise and it can be held to its reputation, not just the swimskin but also the brand. 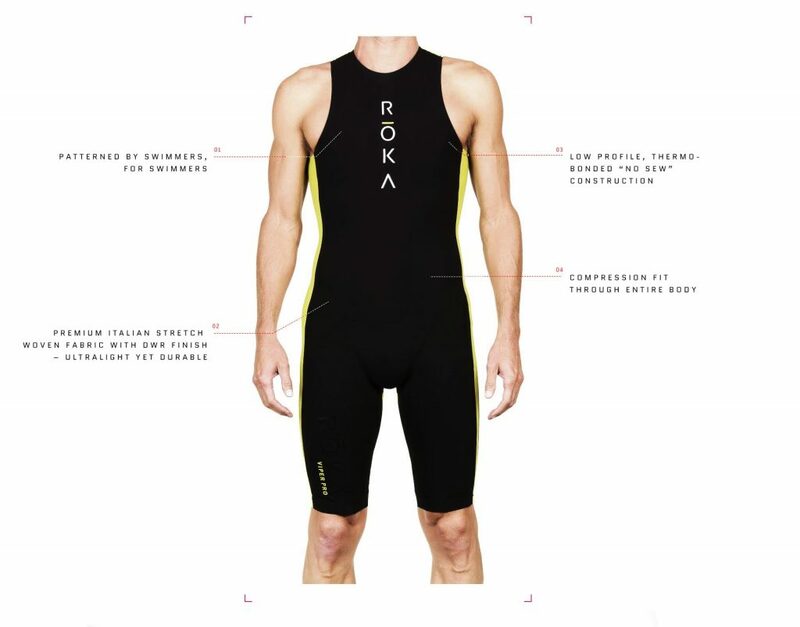 The designers at ROKA created this wetsuit so it can live up its well applauded Maverick Pro Wetsuit. The team designed the ROKA Viper Pro swimskin so that it is both USAT and WTC legal so you can use it wherever you compete. The swimskin is made of two types of the same stretch-woven material from Italy to make you glide in the water. Throughout the suit, the team of ROKA uses a hydrophobic Teflon coating, advanced technology bonded construction for the seams with “invisible” double stitching. The swimskin has an auto-locking YKK that’s low profile so it won’t bother you during the swim. ROKA weaves the second type of stretch-woven material with the first to create a strategic pattern which gives you support where you need it and still lets you swim as you naturally do. If you don’t like your legs looking like sausages, ROKA uses flat seams at the leg holes made of elastic bands with silicone grippers. All of these technical details create a suit designed by triathletes for triathletes. The low-profile, thermo-bonded construction enables arm flexibility while the hydrophobic fabric compresses your whole body. Additionally, the top-line Italian stretch woven fabric makes this swimskin durable. In the water, the swimskin lives up to its hype. Triathletes are very happy with their purchase. They feel as if the swimskin is barely on them, but it still provides enough support where it is needed. It helps them stay streamlined in the water, which reduces their time. Triathletes also like the low-profile suit since it lets them have full arm mobility. Getting in the swimskin requires assistance, according to many reviews by triathletes; however, getting out of it is nearly seamless. All you do is flip the zipper. Do I recommend this swimskin? I do recommend it to veteran triathletes and not beginners. I say this because while it gives some support, it’s not as supportive as the Blueseventy one I previously reviewed. If you know how to swim well and need a little more support on your big race days, this might be a good choice for you. You’ll get the support where you need it and still have the flexibility to stroke normally. You’ll need a friend to help you get into the swimskin, but getting out will be similar if not easier compared to a wetsuit. You might be less nervous knowing you can wear a great wetsuit alternative without sacrificing your stroke. The TYR Toque Elite swimskin is one of the lightest and least absorbent options available to you. The swimskin is dual-natured: it repels water and its quick absorption technology keeps the suit light-weight through the entire swim. The swimskin fits comfortably over any trisuit so you can swim as you normally would. Even more importantly, the company made this suit so it is USAT legal so you won’t have to worry when you show up on race day. If you’re racing outside of the United States please check what their rules are. The swimskin has a light-weight material base with a combination of nylon and spandex. This gives you support and flexibility where you need it the most. Compared to its predecessor, this model is designed with new leg gripper technology. This gives your legs no restrictions in the swimskin and still provides no slippage. The last feature of the swimskin includes a coil zipper with a lanyard, which helps you transition more quickly. And, may even help you get into the swimskin before the race begins. All these features are designed to help buoyancy, enhance speed and increase speed, no matter what level of swimmer you are. Triathletes who have purchased this swimskin said the fit was compressive yet comfortable. Importantly, it fit over their trisuits or their race day apparel of choice. In the water, triathletes have reported that they can barely feel it. They can swim as they normally do in their trisuits or wetsuits. Many beginner triathletes said that the little boost of buoyancy gives them an extra edge on race day. Nearly all triathletes who have worn say that little to no water was caught in swimskin, which made their swims more comfortable. Would I recommend this swimskin? I would recommend this swimskin to beginner swimmers or those who want a more buoyant swimskin option. This swimskin has a small amount of buoyant material, which may give you peace of mind. Especially if you’re a weaker swimmer or new to swimming. If you’re used to having a lanyard when you wear a wetsuit, this might be a good option for you. You might not have to change your transition routine since you simply reach for the lanyard coming out of the water. Something you’re already used to from wearing a wetsuit. If you’re new to swimskins and swimming, this might be a good option for you. You’ll feel a little buoyant in the water without a wetsuit and still swim naturally. Don’t get too dependent on the swimskin and become a stronger swimmer! You might be at a race that won’t require either a swimskin or wetsuit! The Synergy triathlon swimskin is an all-around pick for nearly every level and type of triathletes. 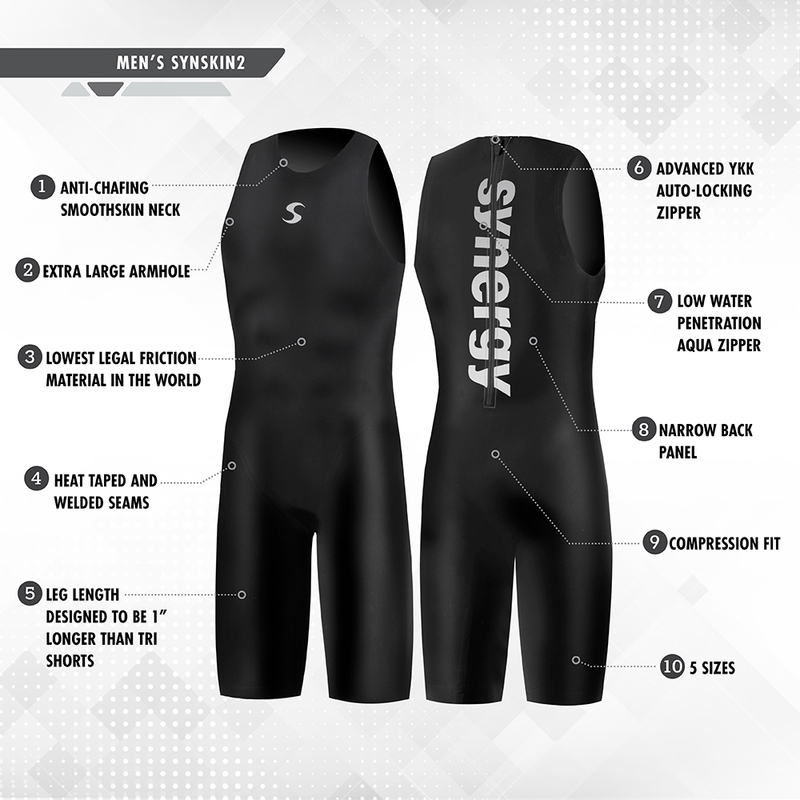 The Synergy team designed the swimskin so that it is both USAT and Ironman approved. The swimskin has the most up-to-date hydrophobic material so it creates the least amount of drag in the water. It also features an advanced YKK auto locking zipper, which created the highest functionality. The swimskin tries to reduce irritation so Synergy created the anti-chafing smooth skin neck technology. Even if the swimskin moves around, it won’t bother your skin when you take it off. You can swim in your usual rhythm in the swimskin since it has extra-large armholes. If you get stronger throughout the season, you can be assured that your swimskin will still fit at the end of it. The swimskin’s is made with high-tech hydrophobic materials with bonded seams. The swimskin’s materials combined with its features help reduce surface drag and muscles vibration to help you swim even faster. In the water, triathletes have said the swimskin feels very light to the point that they can barely feel it. They have also reported that it’s easier to stay in a streamlined position since the compression is very tight. Triathletes love the extra space in the armholes. They don’t feel restricted in the swimskin and still feel supported to glide through the water. The fabric wicks the beads of water as triathletes make their way through the swim. I would recommend this swimskin for more experienced triathletes and strong swimmers, who want an extra boost. You might be able to shave a few seconds off your swim time. And, you’ll be able to swim without feeling restricted with the support and compression of the swimskin. The YKK auto locking zipper is a top choice among triathletes and might save you even more time in transition. I suggest watching Synergy’s YouTube video. It details the most efficient way of getting in and out of the swimskin. This might save you the frustration when you take it for its first swim! What is a Swimskin (Speedsuit)? A swimskin is a relatively new piece of triathlon equipment you can add to your arsenal. Compared to a wetsuit, a swimskin is smaller and thinner and made from non-buoyant material. Similar to a wetsuit, a swimskin is worn over your race kit when the race is not wetsuit legal. For USA Triathlon sanctioned events, if the water is above 78 degrees, you cannot wear a wetsuit. A swimskin is designed to be very tight and hug your body during the swim. Although it lacks buoyancy, it squeezes your body, which reduces friction during the swim. 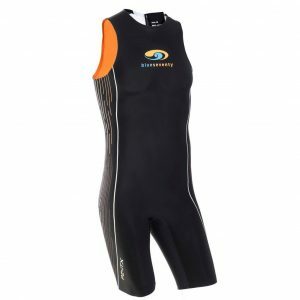 For triathletes, who normally wear a bulky kit, a swimskin is an alternative to a wetsuit. You can still maintain your speed and glide in the water. I mentioned in the previous section that a swimskin helps you swim faster, even if you’re a well-seasoned swimmer. Most swimskins have a hydrophobic coating which repels water and reduces drag between you and the water. A swimskin is like a compression sock, it fits tightly and squeezes your body. Due to its nature, it prevents your body from wiggling or “snaking” in the water. This helps you use less energy and swim faster in the water. A swimskin smooths out the wrinkles in your kit, which reduces drag in the water. It also reduces surface drag. Before I go into the details of a swimskin, let’s talk about your different options. Remember, you need a piece of apparel that will be comfortable to do the whole event in and possibly extra equipment for the swim portion. A trisuit is something you need as your “base layer” when it comes to competing. 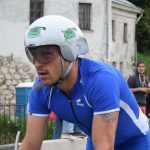 You can wear a trisuit for all three sports and not have to change anything. They are designed aerodynamically for the swim, a small amount of padding for the bike, and still, let you run comfortably. A trisuit can either be one piece or a coordinated two-piece suit. It’s your preference. A wetsuit specifically designed for triathlons are made of buoyant materials that help you stay on top of the water. In this situation, you can use less energy during the swim than if you were just wearing a trisuit or swimsuit. Wetsuits also keep you more hydrodynamic since they reduced drag and compress your body. Lastly, and most importantly, wetsuits keep you warm during the swim portion of a triathlon. This can be important if you’re competing early in the season or doing an early spring open water practice. The neoprene that wetsuits are made naturally adds warmth to your swim. Unlike a trisuit, a wetsuit is optional and can only be used if the water temperature is 78 degrees or below for a USA Triathlon sanctioned event. A swimskin is similar to a wetsuit but without the buoyancy material. You can wear it if you’re swimming in warm water and need or want the extra help. Or, if you’re wearing a bulky race day kit. This is also an optional piece of equipment for race day. You can wear a swimskin if the race is not wetsuit legal. You might also consider wearing a swimskin if you’re racing in mild temperatures regularly. I briefly touched on this question earlier, but I’ll detail it. Remember, a wetsuit is made of buoyant material, which naturally warms up the body. While a swimskin is made of light non-buoyant material. Both squeeze your body and help you stay hydrodynamic in the water. But when do you wear one over the other? Part of that decision is dependent on USA Triathlon if you’re racing in the United States. If the water temperature is 78 degrees or colder, the race is wetsuit legal. If not, you will not be allowed to wear a wetsuit. In the second scenario, you can wear a swimskin over your race day kit and still be able to place. If you regularly compete in mild temperatures, a swimskin would be your only option, if you choose to wear something over your race day kit. A swimskin should fit you very tightly so you can actually feel the benefits of it. Very often, you’ll need a friend to help you get into it. While a wetsuit can be put on yourself with the help of baby oil. Think of a swimskin like compression socks, they are supposed to be very tight. However, they will have a different feel once you get in the water. It may loosen but a bit, but not drag in the water. This is a tough question since it comes down to personal preference and what water temperatures you regularly practice and compete in. It might be like a “security blanket” for you if you’re not sure if the race will be wetsuit legal. You can be assured that you’ll still be able to swim fast in the water without a wetsuit. On the other hand, you could buy it and use it only a handful of times before you decide to store it away in the basement or attic. My final recommendation is to look into it only if you plan to do the majority of your competitions in warmer waters. You might want the extra support in the water since you won’t be able to use a wet suit. • Will the water be warm enough to wear a swimskin? • Will the time saved by wearing the swimskin make up for the time getting out of it? • What water temperatures do you regularly compete and practice in? • Will the swimskin interfere with my current transition “set up”? In the end, the fit and your comfort are the most important factors. If you find a swimskin that fits and does not restrict your movement, then it might be a good option for you. Remember to take it for a test swim before keeping it!